The first large-scale, collaborative study of women’s voices and their vital role in the American transcendentalist movement. 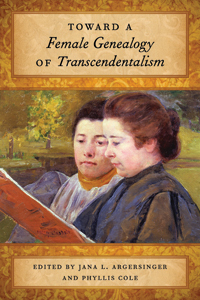 Traditional histories of the American transcendentalist movement begin in Ralph Waldo Emerson’s terms: describing a rejection of college books and church pulpits in favor of the individual power of “Man Thinking.” This essay collection asks how women who lacked the privileges of both college and clergy rose to thought. For them, reading alone and conversing together were the primary means of growth, necessarily in private and informal spaces both overlapping with those of the men and apart from them. But these were means to achieving literary, aesthetic, and political authority—indeed, to claiming utopian possibility for women as a whole. Toward a Female Genealogy of Transcendentalism is a project of both archaeology and reinterpretation. Many of its seventeen distinguished and rising scholars work from newly recovered archives, and all offer fresh readings of understudied topics and texts. First quickened by the 2010 bicentennial of Margaret Fuller’s birth, the project reaches beyond Fuller to her female predecessors, contemporaries, and successors throughout the nineteenth century who contributed to or grew from the transcendentalist movement.